Howard Marks gave a talk at Google back in March ’15 where he covered the origin of his investment philosophy. I scribbled some notes as watched it. I thought it was time to organize things and post it here. His book, The Most Important Thing, is his investment philosophy. He admits that his most important things have changed over time. His thinking is always evolving. The goal was to show that investing is hard, counterintuitive, and to teach people how to think. Taleb says the future consists of a range of possibilities with the outcome significantly influenced by randomness. Galbraith says forecasting is futile. Ellis says if the game isn’t controllable, it’s better to work to avoid losers than to try for winners. Investing is full of randomness. A great return does not equal a great investor. Just lucky is a possibility too. He learned from Decisions Under Uncertainty that you can’t tell from an outcome whether a decision was good or bad because good decisions can fail and bad decisions can work (they got lucky) in a random world. The investment business is full of people who are right for the wrong reasons. Luck plays a bigger role than most people know or are willing to admit. Even if you know what’s most likely, many other things can happen instead. Investing isn’t binary. Things that should happen don’t always happen. You have to allow for multiple outcomes, each with its own probability. The most likely outcome is not guaranteed. When you see things as having multiple outcomes, sometimes you find an outcome you are not willing to accept. 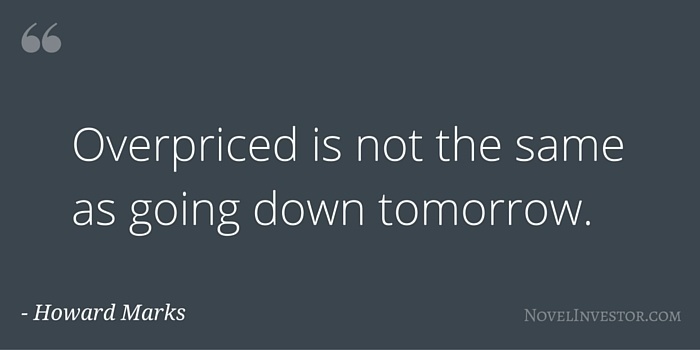 Overpriced is not the same as going down tomorrow. Just because something should happen, does not mean it will happen on schedule or when you want it to happen. Never forget the six-foot-tall man who drowned crossing the stream that was five feet deep on average. The average is a collection of all the good and bad days combined. You can’t live by the averages. You have to accept that some things won’t happen immediately too. Your portfolio must be built to survive the bad days, so you don’t get scared out of your investments. And your decisions need time to prove out. Following forecasts that deviate from what’s expected either make a lot of money or cost a lot of money. Consistently being right, in a random world, is very difficult. The forecasters who make an extreme prediction and get it right are only right once. They got lucky. Yet people put them on a pedestal because somehow being right once is more important than all the times they were wrong. Marks believes the market is inefficient, but it’s hard to take advantage of the inefficiency all the time. A lot of variables need to go right to consistently pick winners. Investing is won by people who avoid the losers. Back then, Moody’s defined B rated bonds as “fails to possess the characteristics of a desirable investment” without any reference to price. The at any price ideology is wrong. Study the Nifty Fifty and Internet Bubble tosee what happens when you buy at any price. How do you make money as an investor? The people who don’t know think the way you do it is by buying good assets – a good building, stock in a good company, or something like that. That is not the secret for success. The secret for success in investing is buying things for less than they’re worth. What determines the success of the investor is not what he buys but what he pays for it. You can overpay for the best assets and lose money. You can underpay for the worst assets and make money. The best of both is to underpay for the best assets. But first, you need to figure out the value in its relation to price. With bonds, the risk is in never getting paid. Of all the bonds that pay 5%, when you exclude the ones that don’t pay, you’ll only get paid 5%. It doesn’t matter which 5% bonds you buy. The only thing that matters is to exclude the ones that don’t pay. The greatness of your performance comes not from what you buy but from what you exclude. It’s human nature. The drive to get rich quick would have to end. Few people think the secret to their happiness comes from prudence and caution. Most people think it comes from that stroke of genius which will put them on easy street. The rare time people are cautious is during a crash, which is the time to be most aggressive. There are no rules, no algorithms, no formulas that always work. Superior judgement, or second-level thinking, is required. You have to think different and be better than everybody else. The problem is most people are not better. A lot of people say I’m gonna take a low-risk approach and invest in index funds. And they are confused. An index fund guarantees you’ll match the returns of the index, after fees. Passive investing removes the chance of losing to the index, i.e. the market. But it removes the chance to beat the index (the market) too. It does not remove the risk of the investment. The index investor loses money every time the index goes down. This doesn’t make index funds bad or wrong. It just means index funds are not without risks. Index funds remove benchmark risk but assume the risk of the underlying assets. You make no money doing the things that everybody wants to do. You make money doing the things nobody wants to do that then turn out to have value. The small investor has an advantage if they are willing to stay small. It requires above average judgement, insight, and time. When people do risky things, the market becomes a risky place. The risk-free rate is the 30 day T-Bill rate. Every other investment is pegged to the risk-free rate. Investors usually have a choice between income or safety (with bonds). Today, safety is paying 0% so investors have a choice between income or 0%. Investors are choosing income (anything with a higher rate) and with it, more risk. Only, they don’t understand the investment or the added risks. They only see a better rate, so they chase it. It’s a race to the bottom. When the risk-free rate rises, every investment must move with the peg. “What the wise man does in the beginning, the fool does in the end.” – buying low versus buying high. “First is the innovator, then the imitator, and finally the idiot.” – on market cycles.